By using the our Fiber Evaluation guidelines, you can save yourself time and expense, and avoid disappointment, by taking a few minutes to evaluate the condition of your fiber before you ship it to us for processing. We will do our best to process your fiber, but damaged fiber or fiber contaminated with excessive vegetal matter sometimes cannot be made into a satisfactory product. Fiber can be damaged in a number of ways. If animals are stressed, a weak point can be created in the fiber. This can be the result of an event, such as being chased by dogs or other predators, lambing, overheating, or by nutritional stress. Some fibers will get sunburned tips that become brittle and break off during processing. How fiber is treated after shearing also can affect its quality. Fiber stored for a long time, or exposed to sunlight or high heat for a period of time, can become dried out and brittle. Fiber stored in the grease will keep better than clean fiber stored for a long period of time. Insects and rodents can also ruin fiber. Test your fiber for strength by holding a small lock at each end with your thumb and index finger and giving a sharp tug. Fiber from stressed animals will break in the same place (you can sometimes see the weak spot), fiber damaged by heat, sunlight, or poor storage will break anywhere. How significant damage to fiber is depends on what you plan to do with it. If fiber shows signs of weakness, it probably is not suitable for machine spinning into yarn, as many fibers will break in the carder, but the fiber may still suitable for making handspinner’s roving, batts, or felt. Please note that our system requires a fiber with at least a 3″ staple length to spin. Any significant amount of shorter fiber will result in a lumpy, unacceptable yarn. Check your fleece in several different places for length while skirting, removing any 2nd cuts or belly wool. Longer fibers up to 10″ are not a problem with our system. The cleanliness of your fiber will depend on a number of factors. 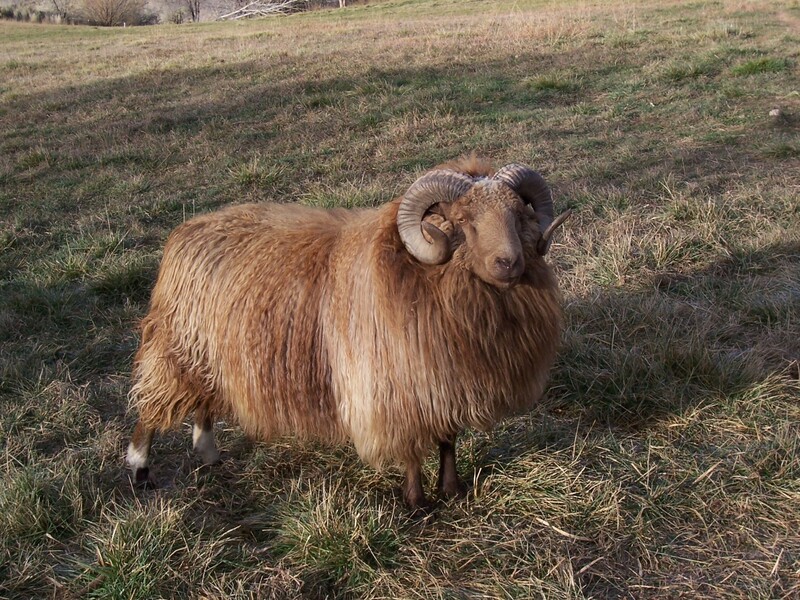 The cleanest fleeces are jacketed or fall-shorn fleeces where animals are kept on clean pasture from the time of spring shearing. Animals fed in low feeders or on the ground stay cleaner than those fed in overhead feeders. For animals kept in pens, straw bedding is easiest to shake out. Wood shavings used as bedding are the worst, as they will damage our equipment and cost us valuable time cleaning the carder. Finer and crimpier wool contains more grease, and holds vegetal matter more than other fibers. Llamas and alpacas take regular dust baths, and are almost impossible to keep clean. In most cases, camelid and goat fiber containing moderate amounts of vegetal matter can be cleaned up in the dehairing machine, but some of the fiber will be lost as well. 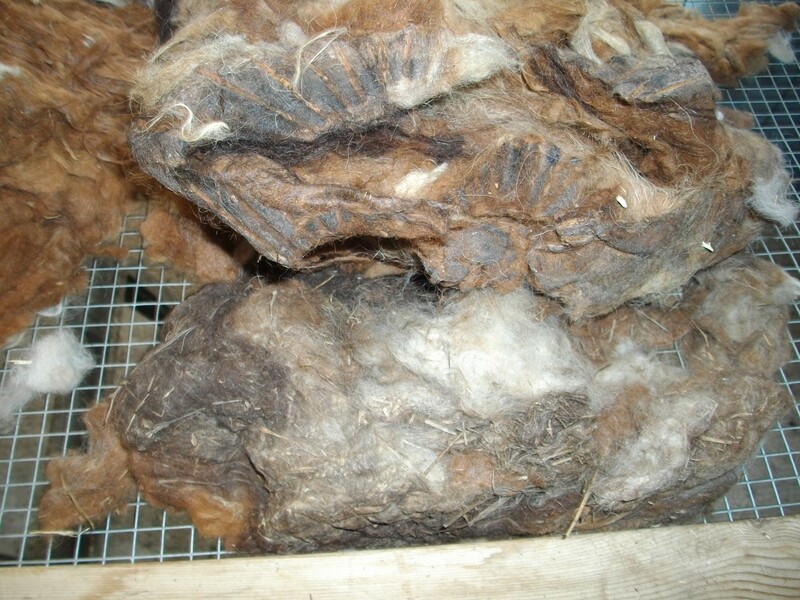 Wool fleeces that contain excessive amounts of vegetal matter usually cannot be cleaned well enough to make a satisfactory product. Fleeces sent to us that contain excessive vegetal matter, as in the photo at right, will either be composted or returned to you at your expense. Fiber should be well skirted. We like to spend about 5 to 10 minutes preparing a fleece for scouring, but if your fleeces require extensive skirting we will have to charge you $20/hr. Skirting will also reduce the weight of the fleeces, reducing your shipping cost and the amount of weight loss during processing. This is to your advantage, as scouring/picking/carding is charged on incoming weight. Skirt your fleeces by removing tags (manure and urine-soiled locks from the back end of the animal) and any large pieces or concentrations of vegetal material. Remove areas that are heavily contaminated, particularly along the neck. Depending on the nature of the fiber, it is often possible to remove much of the fine vegetal matter by shaking the fleece vigorously. This is much more effective with smaller amounts of fiber rather than whole fleeces. 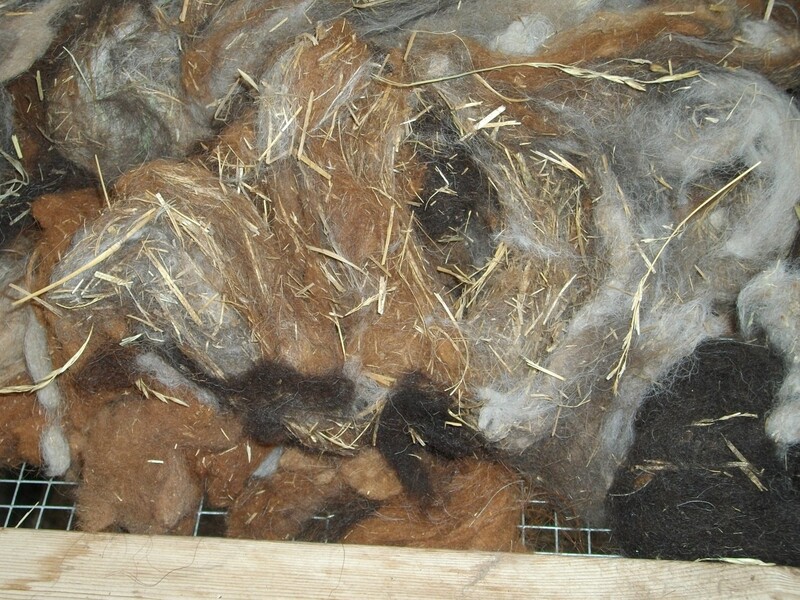 Fleeces with wood shavings cannot be processed without extensive hand removal. How fiber should be stored depends on where you live. Most advice on storing fiber recommends using porous bags to give the fiber some air circulation.This works well in the humid east, south, and northwest, but in the arid west, storing fiber in this fashion for any length of time can lead to it drying excessively. We have kept unwashed wool sealed in plastic bags (see photo to the left) for more than a year in Colorado with no ill effects as long as the wool is not damp! Damp or urine-soaked fiber will mildew if left in sealed plastic bags. Discard the tags and urine-soaked portions, and dry wool before storing. Keep your fleeces out of reach of rodents if possible (they love to nest in bags of wool), and check them periodically, looking for small moths flying near, or crawling on wool, tiny larva, frass (insect droppings), and what looks like cobwebs or cocoons in the wool. Cedar wood or wood treated with cedar oil can protect stored fiber from moths. Please do not treat fiber you intend to send to us with mothballs. Mothballs make fiber very unpleasant to work with.